As we know, the fifth job is coming soon for GMS. According to an reddit user, there is a guide detailing the fifth job and Arcane River. 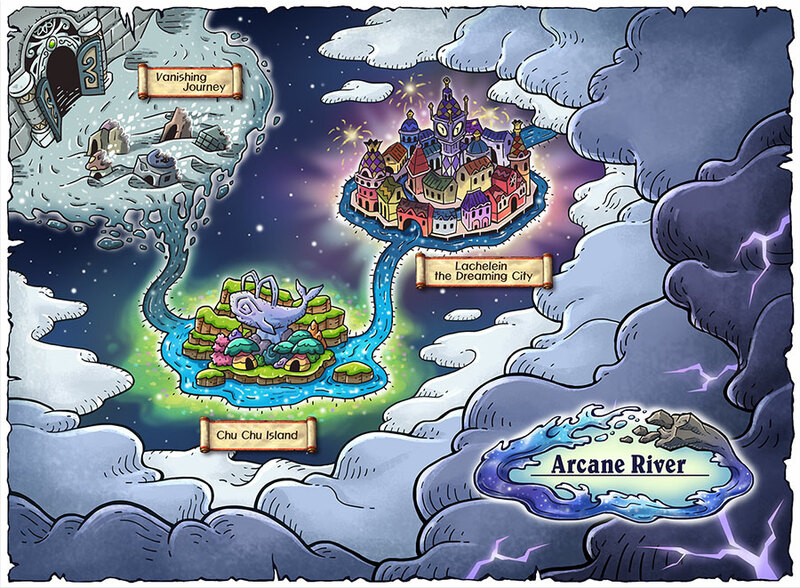 The guide contains the fifth job requirement and how to complete the quest line in the Arcane River. Now, when you get the fifth job patch, you'll probably be very excited and want to instantly get it. However, theres an Issue. You can't immediately advance to fifth job, you'll need to do a quest which will take a MINIMUM of 22 hours. You will have to collect Arcane Stones from the Three Goddesses. The Goddess of Masteria, Maple World as well as Grandis. Masteria's Goddess will be first located in Corrupted world tree. Then, since she's annoying she will tell you she needs to test you and randomly relocate to one of the three maps of the top branches of the corrupted world tree. Its time limited and you have to find her within 5 Minutes. Grandis's Goddess will be located in Heliseum, one portal away from Six Path Crossway. The Goddess will ask you to Kill Magnus, where you can kill Easy, Normal or Hard Magnus. Some classes may be unable to enter the Heliseum reclamation HQ to kill Easy Magnus, but you can use the 7 day world map teleport from Push Past Limits or V diary (both have) to Teleport directly to Heliseum reclamation HQ. Maple World's goddess will be located at the bowman job advancement place with Athena Pierce is. Being nice, the Maple World goddess will give you the stone. Now comes the hard part. You have to activate all the stones. One stone takes 2 Hours to activate. You need to be online the entire time. The stones absorb XP, but you do not need to fill the stones, but need at least 1 xp. They have a capacity of 500Million XP, and turn into XP potions after completion of all the stones. There is an 8 hour codlin between stones which causes the MINIMUM time required to be 22 hours to complete the 5th job advancement. Once you're done, Congrats! You now have fifth job... But theres still a long way to go. You'll get a core gemstone which gives you your first core, your fifth job skill for your job! The Arcane River is the first new place released during fifth job. You require Arcane Force to deal more damage in this area, similar to Star Force fields. There are no kanna safe spots, meaning you can't macro and have kishin, not gonna be that easy. There are also only a few maps which Kanna's can hang on a rope and be safe. These Maps are the Map with Angry and Joyful Erdas, Joyful Erdas, Angry Erdas, Rocky Erdas and Robust Soul Erdas. All other maps are not safe for Bishops or Kanna's. Arcane Symbols can be obtained from the Arcane River in two methods. First you'll have to get an Arcane Symbol by completing the quest line in the Arcane River first though! Your first Arcane Symbol will give you +30 AF and +300 Stat, and requires 11 Symbols to level up to level two, giving +40 AF and +400 Stat. The next level requires 14 Symbols, gives +50 AF and +500 Stat, and the number of Arcane Symbols required to level the Arcane Symbol continues to increase exponentially. Arcane Symbols are Equips and will be in the Equipment Tab, and can be combined by having one equipped and trying to equip another. The first method is killing mobs. The mobs here drop Arcane Symbols and Core Gemstones. With no drop rate, expect about... 1 Arcane Symbol every 5 hours. Im not even kidding. Also, Arcane Symbols are Untradable. The second method is daily missions. After completing the entire quest line, you can do daily missions for 8 symbols a day (5 quests which give 1 each, and if you complete all, free 3 symbols!) These quests allow you to choose a new quest should you not like the one given, but only once. The quests include Killing 200 of a Mob, Killing 130 of a mob (Erda Lanterns only), Collecting 50 Samples of a mob, Collecting 33 samples of a mob (Erdas Lanterns only), Delivering 30 items obtained from a certain section to an npc randomly located in the section. The 5th job relies on a V Matrix system which allows you to Enhance second, third or fourth job skills, or obtain new skills. All these can be done by obtaining cores from Core Gemstones. First, How do we get Core Gemstones? There is currently one method, killing mobs from the Arcane River. Expect about 2 cores per hour without drop rate. They are inter account tradable unless you craft them, in which they become tradable. Before we explain, we need to know how Core Gemstones work. They open for you to obtain a core, which is completely random, can be for any job and is separated into three different categories. A normal enhancement core which enhances second, third and fourth job skills is the most common and has a black background, a skill core gives you a new skill and has a blue background, and the rarest, has a purple background and gives special stats provided you fulfill the conditions. Skill Cores give you new skills. This can be Decent Sharp Eyes, Decent Combat Orders, Erda Nova (Bind for EVERY job), Blink (Random teleport for every job), your specific 5th job skill and your 5th job class skill. They all give bonuses, and give either reduced cooldowns, increased damage or increased duration depending on the core when levelled up. These can be dissembled for 40 Core Pieces. Special Cores give new stats if you can fulfill its conditions. They also expire after a while and are quite useless, for example giving 100% PDR after hitting the same enemy 800 times, your skill cooldowns are decreased by 30% whenever you die. Most of them are useless and it seems like you'd be upset if you got them. Be happy if you got them, since they disassemble for 50 core pieces! Now, what do the core pieces do? you can use 70 Core Pieces to craft a specific enhancement core, 140 for a specific Skill core and 250 for a specific Special Core. Like I said earlier, you also can craft a random Core Gemstone for 35 Pieces, which also makes it tradable. Hope this guide would help you to enjoy the 5th job patch with our guides. More Maplestory guides we will post here in Maplestoryer.com, you can keep eyes close in our site.